The USS Essex Association is a membership comprised of CV/CVA/CVS-9 and LHD-2 shipmates. We welcome anyone who has served on the "namesake" USS Essex to join our organization. Please join us and make this Association a lasting memorial to all those who have served. The USS Essex LHD-2 "The Iron Gator" plaque was enshrined on the Commemorative Wall at the U.S. Navy Memorial in Washington, DC, and is now a part of Naval History. A very special thanks to all of those in attendance. Video and photos from the event and other 2017 reunion festivities can be seen on the gallery page! The 2-sided Commemorative Coins which helped fund the plaque are now available for purchase in our Ship's Store. We have linked our Facebook and Twitter accounts for those who want to check out what we've been up to on social media. Just click on the image above, or use the "icons" located at the upper right hand side of the page header. 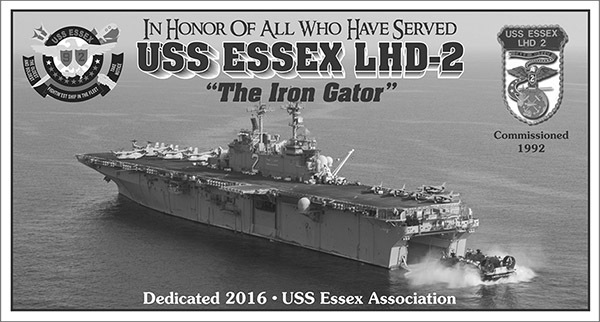 For information about the USS ESSEX Association website and its content, click here to email us.